Attention, winos — our dreams have come true! 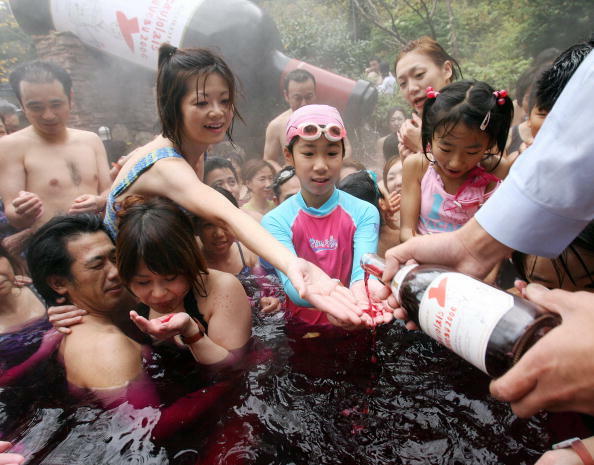 The Yunessun Spa Resort in Hakone, Japan offers guests the opportunity to bathe in a red wine hot tub. 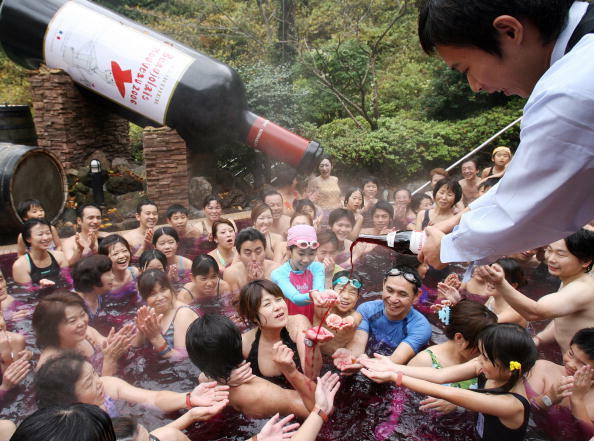 The wine treatment is only open 12 days a year (I assume because a yearlong wine tub would lead to instances of mass truancy in the workplace and a subsequent crash of the Japanese economy) and features a 12 foot bottle of wine that refills the pool throughout the day. 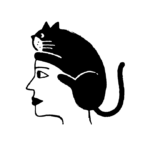 The spa claims that red wine, which contains resveratrol, a powerful antioxidant, is rejuvenating, and that Cleopatra regularly bathed in wine. I’m a little skeptical, but honestly, you could tell me that red wine would turn me into a withered old crone with liver spots and osteoporosis and I’d still dive in head first. If red wine isn’t your thing, or if security tells you you’re getting out of hand, fear not – the spa also offers green tea, sake, coffee, chocolate, and ramen pools. While drinking directly out of any of the pools is “highly inadvisable,” a red wine hot tub is a personal journey, and never let anyone tell you how to enjoy it.